Home > Taking Action > What is an Eviction Notice? If a private landlord, council or housing association want to evict you, they have to follow specific legal procedures otherwise they could be breaking the law. The procedures that must be adhered to can differ depending upon the kind of tenancy agreement you have. For people who reside in council run properties or homes provided by a housing association, you’ll usually have needed to have broken some aspect of your tenancy agreement for them to evict you, but even then you may have the right to appeal. For the purpose of this article, however, it will focus on private tenancy agreements with individual landlords, as there are more instances of eviction notices being served in this sector. It’s also important to remember that some exceptions to rights do apply at different stages so, should you be served an eviction notice, it’s important to seek advice. Most private tenants are entitled to a written notice, even if you did not have a written tenancy agreement in the first place. The notice must be of a specific length of time. This can vary depending on the type of tenancy agreement you have, but in many cases it need only be around 2 months and can be less. It should state the date by which you must leave the property and, if applicable, the reason for your eviction, as well as giving details of places where you can go to in order to get advice. 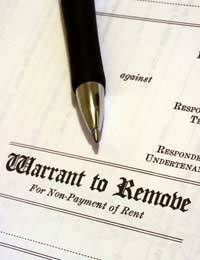 If you have not vacated the property by the date stated on the eviction notice, a landlord can then apply for a possession order from the court. It is the landlord’s responsibility to pay for the cost of administering this. In the meantime, you can remain in the property and sometimes this allows you sufficient time in order that you can, for example, pay off any rent arrears if that’s been the reason you were served an eviction notice. Alternatively, it can give you a bit more time to find somewhere else to live. However, if the matter still cannot be resolved and your landlord ends up having to take the matter to court and you lose, then you might have to pay for the court costs. If the court decides that the landlord is acting within their legal right to have you evicted, then it will be the court who then determines by what date you now need to vacate the property. If you still haven’t left by this revised date, they can then send you a further letter to say that bailiffs will be arriving to evict you. Bailiffs have the right to physically remove both you and your belongings from the property so long as they do not use violence and only use reasonable force. Before this happens, it might still be possible to stop the bailiffs becoming involved but, once again, you’d need to seek specialist advice. It should be pointed out that only bailiffs who have been appointed by the court are physically allowed to remove you from the property. If your landlord or anyone else attempts to do this, they are highly likely to be guilty of illegal eviction which is a serious offence. As mentioned earlier, different rules and procedures can apply depending on the type of tenancy you have. Assured shorthold tenants, assured tenants, regulated tenants, occupiers with basic protection and excluded occupiers are all treated differently when it comes to the law on eviction, so if this is an issue that’s affecting you, you should seek specific advice which pertains to your individual situation.